Vacation, for lack of a better word, is good. Vacation is right, vacation works. Vacation clarifies, cuts through, and captures the essence of the evolutionary spirit. Or something like that. During our two weeks in paradise I read six books. I toodled around the lake in a kayak. I slept in. I caught 2 smallmouth bass big enough to eat (at out-of-state fishing license prices that's $20 per fish). I beat my dad at cribbage 3 times (he beat me 7 times). I hiked up and down lots of trails with my beloved. I wore jeans and fleece in July. And I ate amply from the four major Grand Marais food groups: fish, fudge, donuts, and Sven and Ole's. No TV. No bliggety blog. No cell phone service. No Internet. And when I returned after 16 days I had accumulated only 15 emails that I actually need to reply to. That's less than one consequential email per day. Ladies and gentlemen, I'm happy to report that it is indeed possible to unplug. And it's not greedy to do it. For all my MN friends and family who are tired of March weather. It's two minutes too long, but still funny. No one does weather coverage like the Minnesotans. No one. I was reminded of this yesterday while nasty thunderstorms were creeping east toward the Twin Cities on radar images that blazed red and orange. By 6 pm all of the local affiliates had completely dumped out of their regular programming and it was all storm, all the time. And it was a big one - in some places up to 70 mph winds, multiple tornadoes, and some very ominous-looking clouds as it all approached the western Twin Cities. Storms like this give the local news stations the opportunity to show off all their supermodernhightech weather tools, with manly names like "Viper" and "NexRad." They also cause weather people to be really, really stupid. Meteorologists are all about the safety, but contemporary local television news is all about the images and the interactivity. Not the best combination. More than once last night we got mixed messages. On the one hand, we were told to run for cover, head for our basements, find a windowless room, go into a ditch rather than under an underpass. On the other hand, we were also instructed to wander outside during a tornado and lightning storm with our digital cameras and cellphones to take pictures of all the devastating devastation. Then, we were exhorted to go back inside (during a lightning storm, remember) and fire up the computer to e-mail said photos to the local news, so they can put them all on the air. Yesterday my mom forwarded me an article from the St. Paul paper detailing how Itasca State Park is experimenting this summer with free wireless Internet access. This makes me cranky. Itasca is the oldest state park in Minnesota, and also one of the busiest. Despite my frequent professions of love for another patch of paradise, Itasca is where I spent nearly all my childhood summer vacations. 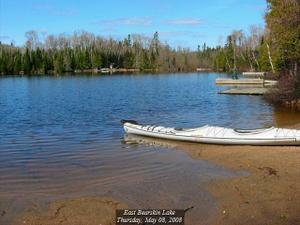 It's where I learned to fish, play cribbage, and paddle a canoe. It's where you can walk across the headwaters of the Mississippi River simply by stepping across a few rocks. With the rush of walking across the Mississippi River headwaters still fresh in your mind, you can blog about your experience just a stone's throw away at the Mississippi Headwaters Plaza via high-speed wireless internet access available now at Itasca State Park. Hmm. Okay, first of all? Walking across the headwaters is not a "rush." It takes 30 seconds. Very small children do it. It might be a rush for them, but if you're old enough to "blog about your experience," the experience itself will not be a rush. In addition, I hate the Facebook-generation appeals that imply, "If you didn't blog about it (or photograph it, or whatever), it didn't happen." Finally, from what the article suggests, folks using the service aren't really even members of the wired generation; they are more likely to be adults hopping online to check e-mail and stay in touch with the office. Which is more sad than cool. Can't we all get away from the office once in a while? How important are we that we can't take a break from email? This week my beloved and I were supposed to be in the wilderness ourselves - no laptops or blogs or email or TV, but with ample entertainment in the form of lakes, trees, hiking trails, fishing, and family. I'm annoyed that all those people who get to be in the wilderness are wasting time online when they could be experiencing the "rush" of moose watching or dumping over in a canoe or telling tales of the one that got away. They could be having my vacation, but instead they're pretending to be at the office. How nuts is that? This week my high school alumni magazine arrived in the mail. Paging through it, I came across an article about alumni parents. There are a lot of them at my alma mater; this is St. Small, after all. The article made the point that Gen-X alumni parents are beginning to arrive on the scene, slowly taking over from the Baby Boomer parents. The truly horrifying part? All six "Gen X" parents they profiled in this article? Parents who now have freshman, sophomore, or junior sons and daughters? They all graduated after I did. Ice out! And it's May 8th! I wish there had been a pool. Looks like ice-out's coming to paradise any time now. But be sure to check with the experts before you toss your money in the pool. My guess for East Bearskin is May 8; that would be about average. 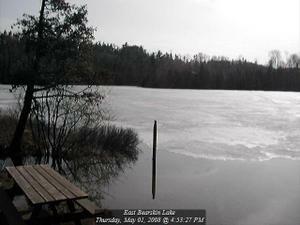 And just in time for fishing opener on May 10.